I have been a bit absent from the blog for a while. This will be the last post from Fig Tree Creek Permaculture. Brodie and I have split up and will be selling the property. Before we sell we will be doing a big renovation which will keep me busy for a while. After that I plan on saving up for a couple years and preparing my car for a BIG trip around Australia, WWOOFing my way around permaculture properties. I have been thinking about doing this for a while now and the opportunity has presented itself (not exactly in the way I wanted, but beggars can't be choosers!). I will keep the page open for a week or so before I close it down. I hope everyone has enjoyed my journey with my property and have learnt something along the way! I certainly have and will be applying what I know to any properties I may have in the future. It has made me more committed to Permaculture and what it can achieve for our planet. If you would like to keep in touch I have renamed my Instagram to Kat's Permie Journey, so please give me a follow! All the best in your journeys and remember always: Earth care, People care, Fair share. 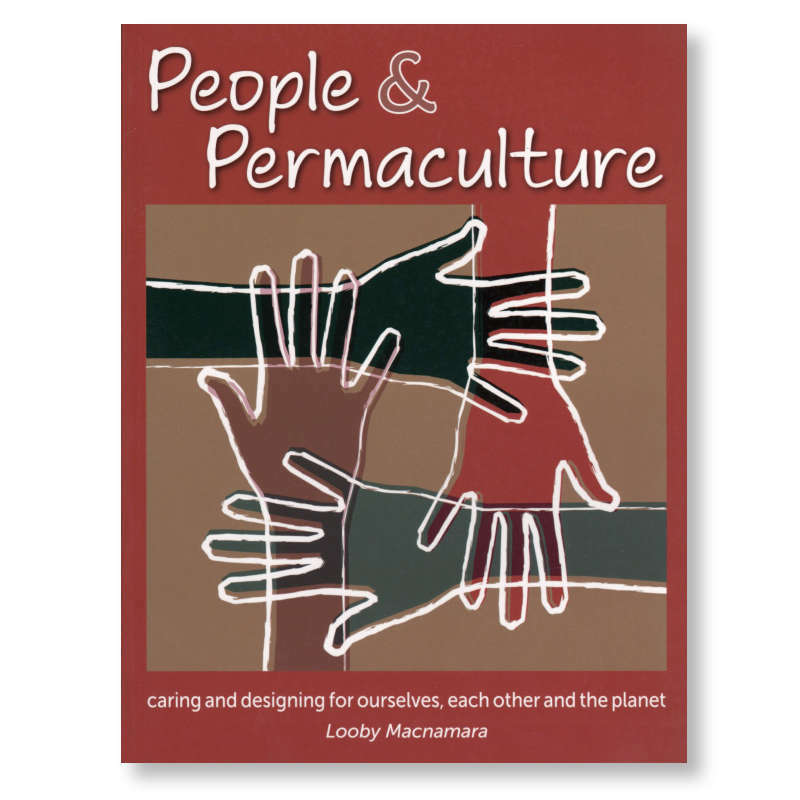 I recently finished a book that I borrowed from the library called People and Permaculture by Looby Macnamara. I had read good things about it somewhere and I thought I would check it out. It is about the people aspect of permaculture and how it can relate to individuals, groups and the world. As someone who is a very logical person and struggles with managing my relationships and feelings this book brought it all back to permaculture principles which was exactly what I needed to read. I read the odd 'self help' book but this one really spoke to me. She goes through the first few chapters defining permaculture and how it applies to people, such as the ethics and patterns. A third of the book is how permaculture can apply to yourself and your life and relationships. As I find permaculture a logical way of thinking I found this very useful to apply the same knowledge to my life and see what is and isn't working. I enjoyed working through the activities that were suggested. The next part of the book is written for groups and how permaculture principles can apply to them to allow for harmonious relationships. As I feel I am still working on myself at this stage it wasn't really relevant to me but I could see that it could be useful to community groups or families. I think a good place to apply these principles would be a shared permaculture household, like David Holmgren explains in his book Retrosuburbia (another fantastic book). The last part of the book is written on a global scale and how we could more forward as a planet. This involves learning from other cultures in a sensitive way and thinking about the future generations. There are a lot of interesting concepts in this part that is hard to visualise on a day to day basis but when explained in the book it makes a lot of sense. One good example was if the world was represented by 100 people; 1 would be dying of starvation, 17 would be undernourished and 15 would be overweight. Very striking statistics. The book is essentially a guide to live our lives in a more permacultural way. I got a lot out of the book and will buying a copy for myself in the future and revise it often. Although the group part isn't relevant to me right now I would like to have it as a reference in the future. Over the last few weeks we have had some uncharacteristic but welcome heavy spring rains. They have broken the dry spell in our area and we have received probably over 300mL so far. All of our trees and plants are looking a lot happier. This is front little garden, it has our old dwarf citrus trees and some veges inbetween. After being cooped up for a few weeks we decided to get into the garden on Sunday and get some jobs done. Brodie spread out some mushroom compost around the front yard a few weeks ago so I decided to top up the beds with a bit more mulch. These beds should be good for a while now. This is along the boundary fence. There are pigeon peas, QLD arrowroot and some small trees in here to try and create a living fence. This is along the other boundary. I planted some volunteer pumpkin plants in here too. That spindly plant is a bamboo that we hope to use to cover the ugly shed next door and use the sticks for building trellises. We dug up most of Brodie's leftover market garden that was at our place. We want to grow more of our own food over the summer. It is a good period here as we usually have pretty good rainfall and everything grows very quickly. The bits of timber in these photos were given to us by a friend and will form slightly raised beds. We figured this is the best way to go as it is a little slopey here. The reason they aren't assembled is because we ran out of screws! With all the leftover green material I made a big compost pile in our old bays. We finally got to set them up, 2 years after we have moved in. A week ago I also made a batch of sauerkraut from cabbage from our garden. It should be ready this weekend. It is satisfying to use our own produce again, lets hope we can get some real productivity over summer. While it has been so wet we have been catching up on jobs inside like installing ceiling fans and lights. We also got our old leaky concrete tank fixed, now we have 15,000 gal of storage or 57,000L. Feels good to have our water capacity increased again before the summer rains. Unfortunately I have been completely unaware of all the changes that Blogger has been making and I have missed everyone comments since May! I just assumed no one was reading which is a bit sad! I am glad to find everyone's comments finally and I will respond a bit quicker from now, promise! Usually we have a big push to do something when we get fed up of looking at it. This time it was the bank between the pool and the house. This is an old photo that I found from back in April. I left the plants there because they apparently produce edible roots. We found that they were little knobbly hairy things, not worth the plant space! There was also a heap of cobblers pegs and other weedy plants. I had tried to previously plant some perennial greens in the area. We suspect that most of the pile is subsoil from when the pool was dug out so they didn't go very well. We decided instead to grow some natives there as the soil is so poor it wasn't worth growing anything edible. It is also very steep so I didn't want to grow something that would make us trek up and down the slope and cause damage. We went to our local Landcare native nursery and bought some small shrubs and groundcovers. First we pulled all of the plants out. By the way that is our new house external colour. The blue hasn't been painted yet. It will be the same grey as the trim. Those logs are holding up some of the slope as there is a flat pad up the top. This is part of Benny's racetrack. Then we spent a bit of time cleaning up the small rock wall at the bottom. This is something we have around a lot of around our gardens. We have a lot of rocks! We laid a thick layer of newspaper and topped it with mulch. We went with newspaper here because we thought cardboard might slide down the slope. After we finished the area, we put our new plants straight in and watered them. A day well spent! Hopefully the plants can get established this summer. In other news, Brodie's small farm, The Cottage Farm, has been going great guns. Here is a photo I have of Benny and I sitting on the ute while Brodie waters his crops. There is a lot more in the ground already from when I took this photo. He is getting great yields out of his beds so far and has new chefs coming on board. Now we just have to wait for everything to grow. It should pick up now that it is a bit warmer. I had no idea but I haven't posted anything since April!! We have been very busy with off-property activities and have been taking a bit of a break. Brodie had to have Carpal Tunnel surgery which has slowed us down a bit. He has had it on his left hand and is due for his right around the end of June. The first surgery went well and he has had almost instant relief. It was really bothering him before he got the left hand done so when it is all over he will be a lot happier. And yes, I was driving! We managed to get it out without a tow. It was a good experience. And this is what I got out of it! I have planted more along the fence so when they have grown a bit they should make a good privacy barrier. We have also had a spell of cold weather over the weekend with single digits overnight. We have been having the fire on even in the morning and I have been cooking our breakfast (porridge) on the fire. It is a different but very nice experience. We also installed a small ducted system to push hot air from the loungeroom to other areas of the house. It has features a quiet inline fan and makes the whole house very warm on those cold nights, whereas previously we had a very hot loungeroom and very cold house! Last weekend was the Maleny Show and Brodie and his mum were asked to give a last minute presentation to fill in for someone who had to pull out. They gave a very interesting speech on how their micro farm was set up and there were lots of questions at the end. On the way back we stopped in at our favourite brewery to grab some beers to go. We found out they now do Growlers, which we can take back and get filled up. Zero waste, locally brewed beer! How good is that! Brodie's dad also donated to us a bunch of building materials that he has no use for anymore. Now we have a whole heap of great building materials for our future projects, including lots of hardwood. It has been a great and challenging couple of months. It has been nice to step back from the property for a bit and have new experiences. Hopefully big news coming soon regarding the house! This past weekend saw us emerging out of the very wet weather we have had over the past few months and the temperatures have started to drop. Perfect weather to get stuck in and do some work. I don't have any before photos this week because I didn't know exactly what we would be doing. Here is what we achieved. We made a dent in the woodchip pile and tidied up the path from the driveway towards the house (i.e. buried the problems). We also used some logs we had from chopping down the leopard tree to shape the bed where the citrus trees live to the left. We topped up the woodchips here too while we were at it. These are some of the grubs we found in one of the old chip piles. Massive! We pruned, weeded and mulched around these azaleas next to the driveway. If was pretty hard to get out of the car here before! Not sure what to do with this area yet so these shrubs can stay for a bit longer. We weeded and mulched under the fig tree. We also fixed the chook house which had taken a bit of a tumble. Just have to dig a swale along the tree drip line and put up a fence and we will be ready for some fresh eggs! I have also been reading Retrosuburbia, the new book from permaculture co-originator David Holmgren. I borrowed this one from the library but I might get my own copy. I have been enjoying it a lot so far and brings into context some of the ideas I have been thinking about. I think Benny likes it too! We have this Wednesday off for Anzac Day. We will go to dawn service and see how the day goes from there. This weekend is meant to be sunny and cool, bring it on! Ever since I have started working with nature and spending more time outdoors I can't help but notice the effect the moon has on me. Perhaps it is because I am a woman. I am not sure, but I can't dispute the fact that every time it is full moon I never sleep very well! I read a book by Lyn Bagnall called Easy Organic Gardening and Moon Planting . In it she described that moon planting hasn't been proven, but by what she has seen in her own garden that it could be possible. So I am going to give it a red hot go. This is because sap flow is low and prevents regrowth. This is a much longer period than the others and will cover two weekends this month. So on the 7th & 8th I prepared the herb garden which involved pulling out some weeds and fit in with this cycle. Last weekend (14th & 15th) my parents stayed over so no work was completed. I don't think I can plant things for two weekends so I will have to do some other tasks instead, but I will try to minimise the weeding. I will definitely start some more seeds as my tiny shadehouse is freeing up a bit now. An aspect of Lyn's book that spoke to me was even if the moon planting has no effects, it still creates a cycle of tasks to occur in the garden. I really liked this as at the moment I am kind of running around like a headless chook being quite overwhelmed with all the things that need doing. By separating the tasks I hope to keep my workload under control and receive the best results for my efforts. I bought this Moon Calendar Wheel to help me with my planning. I reset it at the beginning of the month according to the date of the new moon. It is very simple to use and has easy to understand explanations of the phases of the moon on it. I highly recommend it. I am looking forward to giving my weekends a set purpose and seeing some results. Step one: Collect materials. For this method of bed formation we wanted a weed barrier, a fertiliser and a mulch layer. I got the paper for the weed barrier from when we moved offices at work as everyone was throwing away old documentation. I have been squirreling it away at our place until we needed it. For this garden I used mostly manila folders to see how they go. For the fertiliser my MIL had some leftover composted cow manure from her garden, so she kindly donated it to us. We used this because it was available to us and locally sourced but you could use any type of well rotted manure. For the mulch layer we used woodchips. Any conventional mulch could be used here. There were some contractors clearing around powerlines just around the corner and Brodie had a chat to them and got a whole truck full of woodchips delivered to us, for the very convenient price of a case of beer. This is the pile with a dog for scale. This is the area before I started. It was a bit neglected as we had been concentrating on other areas. Step two: Pull out any vegetation in the area, then rake to remove rocks and large chunks. The leftover rocks in this bed helped to create the border. Step three: place the paper weed barrier overlapping over the raked surface. In this photo both stages can be seen. Step four: Add the fertiliser layer on top of the weed barrier layer. I mostly did it at this point to prevent the papers from flying away as I was working. This is most of the garden area with the weed barrier and fertiliser layers. Step five: Add the mulch layer. Some of the woodchips we got from the contractors had a lot of leaf matter in it so I used it for the garden. It is less chunky and should break down quickly to add fertility and organic matter. I put this mulch down to about 5cm thick. Step six: Repeat the steps until the whole garden is complete. By using local materials available to us we have helped to improve our soil and prevent further carbon emissions. It cost us negligible amounts of money for this area and we prevented some papers going into landfill. We planted out the bed with basil, lettuce and silverbeet. We haven't got a lot of herb seedlings to plant which is why we decided to get some greens in the ground as well. I also installed the retaining wall to the right at the same time to create some separation from the deck and reduce the slope a bit. These were scavenged from the property. I hope this can help someone to build their own garden bed, let me know how you go! This time of year is great to do it as it is cooling down and lots of great herbs can be grown, like my favourite, Coriander!